Albedo is the fraction of the Global Horizontal Irradiance that is reflected. when the surface is very dark and when the surface is bright white or metallic. 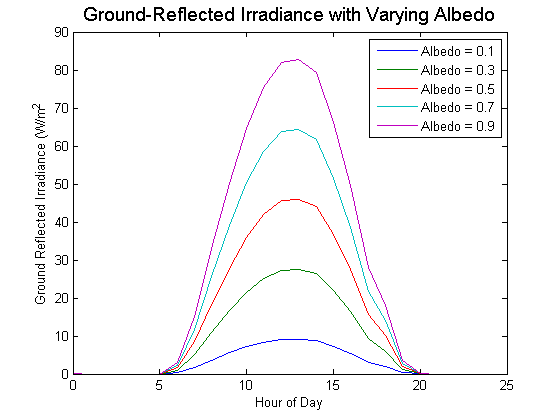 Below is a plot comparing the effect of different albedo values in calculating the ground reflected irradiance on a latitude-tilt PV array in Albuquerque, NM in August. It is clear from this plot that the effect of albedo can be significant especially when snow is present. The difference from dry concrete or asphalt (~0.2) to fresh snow on the ground (~0.8) can boost PV output by 5-10%, assuming the array remains snow free. Accounting for changing albedo may thus be important in climates where snow is present on the ground for a significant portion of the year.